Winters in Scandinavia can seem endless, and many Scandinavians have developed ways to make the elements work for them. Witness this fantastic FPV video from karlsson on the roof. 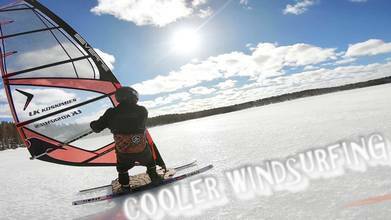 It captures a winter version of windsurfing on a very frozen Lake Saimaa in Finland. The lake is enormous, covering 4.4k square km (1.7k square mi.) in the southeastern part of the country. The temperature during filming is reported at around 0 Celsius, but that's before the effect of the 20-30 knot winds. Description: Nice Ice windsurfing session with FinFifty Kale. The air temperature was around -1 degrees Celsius, wind speed at 20-30 knots. We had 4.2 Severne/Simmerstyle sails and custom-made boars with speed skiing skis.